We demonstrate a facile and effective approach to significantly improve the photoluminescence of bulk MoS2 via laser thinning followed by gold particle decoration. Upon laser thinning of exfoliated bulk MoS2, photoluminescence emerges from the laser-thinned region. After further treatment with an AuCl3 solution, gold particles self-assemble on the laser-thinned region and thick edges, further increasing the fluorescence of bulk MoS2 28 times and the Raman response 3 times. Such fluorescence enhancement can be attributed to both surface plasmon resonance and p-type doping induced by gold particles. 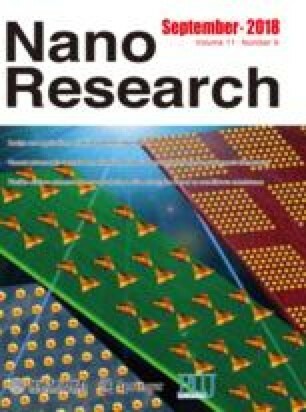 The combination of laser thinning and AuCl3 treatment enables the functionalization of bulk MoS2 for optoelectronic applications. It can also provide a viable strategy for mask-free and area-selective p-type doping on single MoS2 flakes. Supplementary material (schematic diagram of focused laser beam set up, AFM images, and PL peak position maps) is available in the online version of this article at https://doi.org/10.1007/s12274-018-2037-5.